a book review by Cindy Helms: Where's My Teddy? British author and illustrator Jez Alborough has been writing picture books for over 25 years. His characters run the animal gamut from ducks to monkeys, penguins and giraffes, farm animals and, in this case, a bear. 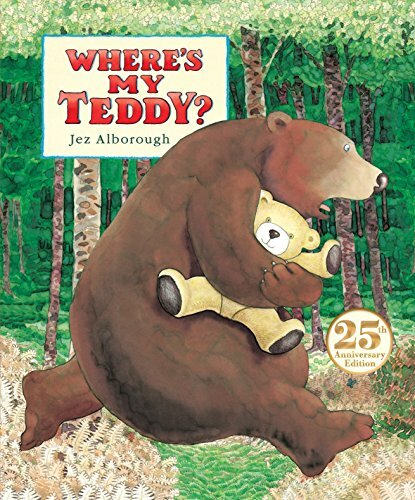 First printed in 1992, this current (2017) release of Where’s My Teddy? is celebrated as the 25th anniversary edition. This super simple story finds a young boy, Eddie, in a “dark and horrible” forest on the hunt for his lost teddy bear, Freddie. Jittery and uncomfortable without his companion, Eddie is eager to recover the missing Freddie and get back to bed. When he does indeed stumble upon a teddy bear he is shocked to find it has grown. This gigantic teddy is far too big. It is no good for snuggling and impossible to tuck into bed with him. A worn out and stumped Eddie sets himself down on giant teddy’s leg to figure out what to do when he hears a crying sound coming closer, getting louder. “You’re too small to huddle and cuddle,” the voice sobs. Eddie scampers behind giant teddy, hiding from the approaching voice. Out from the gloomy trees lumbers a huge brown bear, eyes cross and angry, totting a minuscule teddy bear in the crux of his arm. When he sees his own giant teddy, everything gets sorted out. Bear is surprised at finding a boy, Eddie is elated at finding his small Freddie. Bear and boy bolt away in opposite directions, with their appropriate-sized snuggly in hand, back to their own safe and sound beds. The end. Alborogh’s artwork is as simple as the story. The forest setting remains unchanged from beginning to end for all but one spread. Even as Eddie is walking along, there is little difference in the trees, the moss, the paths. A pair of subtle squirrels appear at one point to liven things up, but otherwise there is no life in this ordinary wooded expanse. It might have been more fun to have other little critters join in the hunt, or at least watch the hunt as Eddie wanders along. In this case, the setting is lackluster. When the surroundings do change, and both Eddie and bear are back in their beds, it seems out of place and disappointing that bear should be in a human bed, complete with headboard, pillow, sheets and blanket. Giving bear a creative wilderness den, a cave, branches, a bed of leaves, anything to indicate a cozy nook for a hibernating bear would have added dimension to the story. Still, Where’s My Teddy? is cute and highly appropriate for a toddler bedtime tuck-in.